Repo rates were once again today above the upper “ceiling” of the FOMC’s intended corridor, marking three consecutive trading days exploring territory not meant to be reserved for secured overnight lending. The MBS GC rate hit 60 bps, surging with agency GC likewise nearing 60 bps. The UST rate fell slightly but remained just above the 50 bps upper limit. Notably volume has tailed off (at least as reported by DTCC, keeping in mind that most repo is done bilaterally out of sight) in both MBS and agency repo. 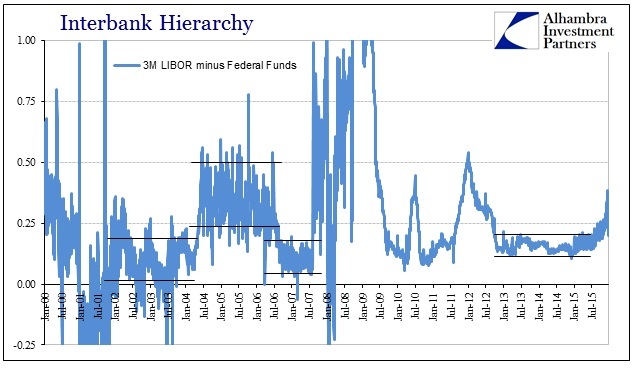 When the FOMC was last trying to raise money market rates in 2004 and 2005, into 2006, repo and federal funds preserved the expected hierarchy. Federal funds, effective, traded above the GC rates owing to the difference between secured and unsecured money lending. There was much more parity in late 2006 once repo collateral started to gain unwanted, though thoroughly warranted, scrutiny. In addition, LIBOR in that period also traded at a positive spread to federal funds. 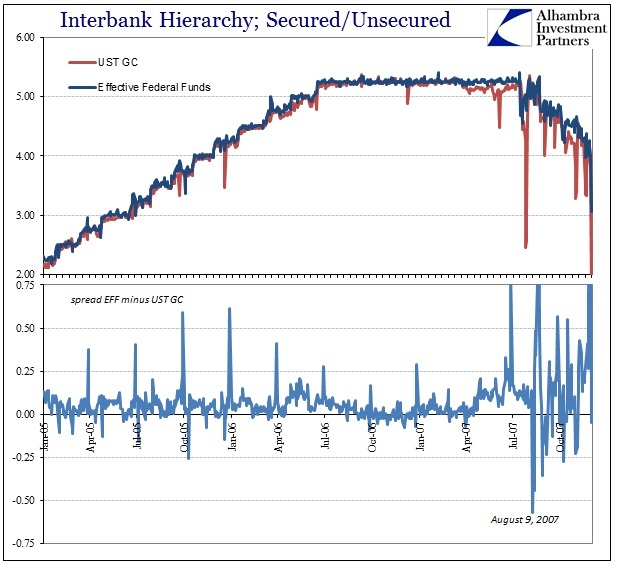 Both being unsecured, LIBOR included term premiums owing to the difference in maturities (a geographic, eurodollar premium was not exhibited until after August 2007). By that hierarchy, we can assume, in descending order, LIBOR, federal funds then repo. Based on these historical interpretations, LIBOR (3-month) seems to be rather well-behaved at a recognizable premium to federal funds while repo does not. Further, as noted last week, when adding treasury bills based on historical TED spreads, T-bills are also non-conforming still this week. None of this is surprising since LIBOR and federal funds are less active than they once were, particularly in comparison to pre-crisis. It is the repo market that stands out, including the potential significance of treasury bills. Since there aren’t any guidelines about how money markets “should” work under non-ZIRP conditions, this kind of calibration will have to suffice until further history develops. While the FOMC simply expects money rates and markets to follow along as they once did (or thought they did), that is a mistake since money markets are nothing like what they were the last time the Federal Reserve attempted such heavy “tightening” influence.